I am drawn to lavender roses and always searching for “the one.” The right lavender can be calming, healing, inspiring. 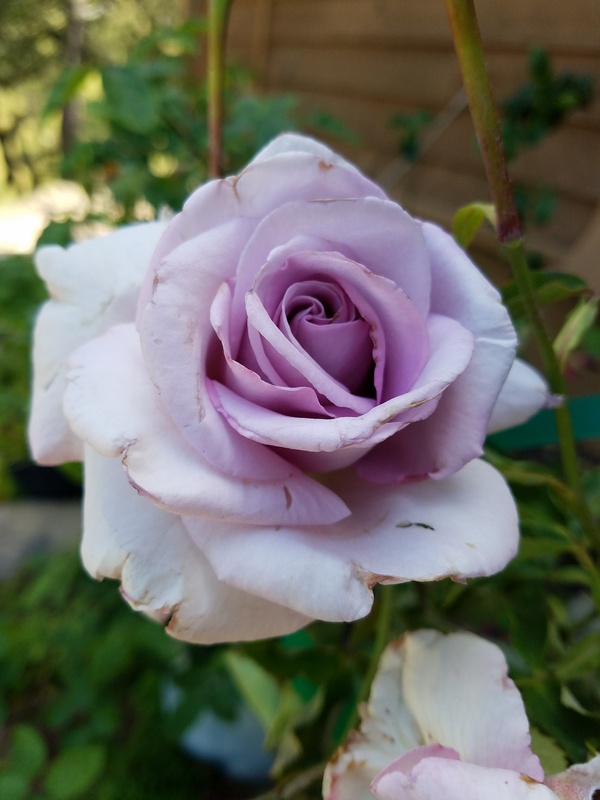 Prior to today, the closest I’d come was “Blue Girl”, a classic hybrid tea of confusing parentage that produces lavender-blue, longish buds that develop into upright, large, full, deliciously fragrant booms. I live in zone 9b and, once established, “Blue Girl” produces continually. The problem: it lacks pizazz. At today’s Celebration of Old Roses, sponsored by the Heritage Roses Group Bay Area (HRGBA), I met rosarian Tom Liggitt and fell hook, line and sinker for his “Parfum de Blanche,” a silvery lavender rose with a wonderful form and heady fruity fragrance. I came home with a gallon size plant that has about a half dozen roses in various stages of bloom. I’ve posted some pics. While it has some road wear from being hauled all over the Bay Area and being in a small pot, I can’t wait to nurture this baby to full health and see how those glorious blooms hold up in the vase. 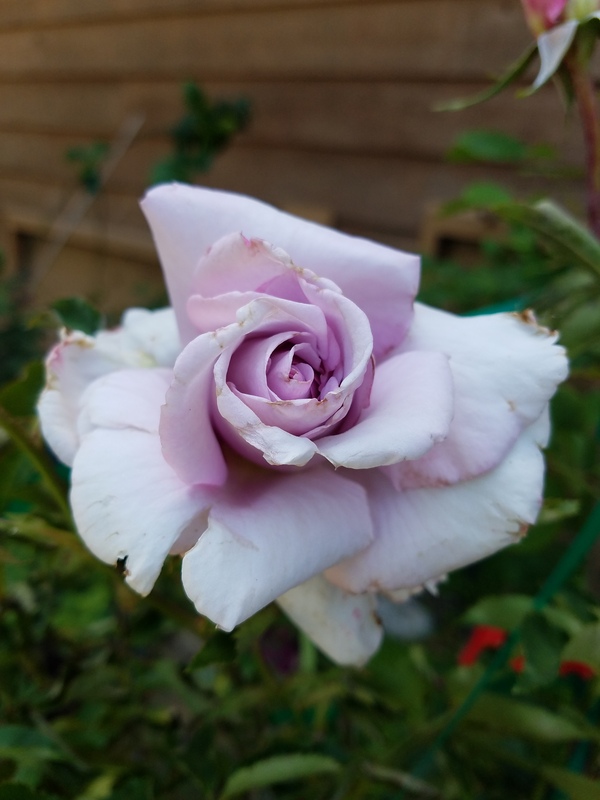 What I love about Blanche is its ruffled petals and silvery hues which range from a rosy mauve lavender in bud to a silvery gray with slight pinkish hues at the center when in full bloom. Blanche is a substantial rose, a star, that begs you to cup it in your hands and inhale. And when you do, a world opens up, an old, romantic world. “Parfum de Blanche,” bred by Ted Liggitt. Liggitt, the founder of the San Jose Heritage Rose Garden, describes his passion as “non-stop plant research.” He brought several flats of his roses in bands and gallon pots to sell today and was moving them quickly to rose addicts like me who will always find room for another rose. Liggitt is especially proud of “Parfum de Blanche.” Over the years, he worked with some 3,000 variants of the famous lavender rose “Lagerfield” (grandiflora, Jack Christensen, 1986) and boiled them down to three superstars, one of which is “Parfum de Blanche.” His gorgeous roses went unnamed for 15 years until he met and married Blanche, the only woman worthy of naming his roses after. Blanche was at his side today helping usher her namesakes on to their forever homes.